Don't get too excited. I am not offering a contest to meet the esteemed British actress but I do have news that she now has a rose named after her. The David Austin roses for Spring 2019 have been introduced with three beautiful additions for gardeners in the United States and Canada. Here are detailed descriptions of the 2019 North American introductions provided by Michael Marriott, technical director and senior rosarian of David Austin Roses Ltd in Albrighton, England. For more on these and on the full collection of 114 English Rose varieties now available to North American gardeners, see www.davidaustinroses.com. 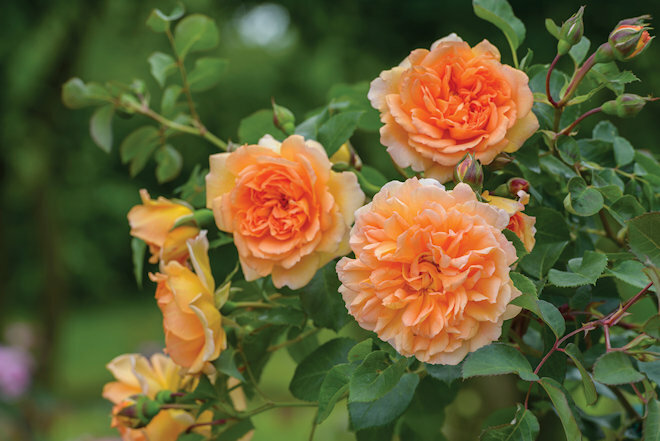 'Dame Judi Dench’ is an apricot English Rose with an arching habit that marries lissome beauty with robust garden performance,” says Marriott. The large flowers are a rich, sun-kissed shade of apricot that pales prettily toward the edges. Blooming starts with plump, red-tipped buds held on mahogany-colored stems. The flowers gradually open to reveal informal rosettes of ruffled petals with a classic button eye. The outer petals are softly fanned to catch the sun, which creates the charming halo effect that Mr. Austin favors. Though large and densely petalled, the flowers ride high, nodding slightly, and are especially resistant to rain. After bloom, the spent petals fall away cleanly. The tempting fragrance combines a fresh tea scent with teasing notes of cucumber and a hint of kiwi. This marvelously-relaxed bloomer provides big color from early summer till frost. The apricot hue mixes beautifully with other garden colors – even strong pink, lime and strong yellow. Of course, its BFFs are blue and purple flowers, plus plants with purple-bronze foliage. For real zing, suggests Michael Marriott, pair ‘Dame Judi Dench’ with deep crimson English Roses ‘Darcey Bussell’ or ‘Munstead Wood’. 'Dame Judi Dench' is a variety that builds over time as its arching stems encourage side shoots to form an attractive mound of blooms. Typically, in years one and two, the bush chugs along at approximately half its mature size. By year three, lanky adolescence is a thing of the past as the bush gains full size and maximum bloom. Detail: ‘Dame Judi Dench’ is a particularly strong, healthy, reliable English Rose with fabulous rich apricot flowers. It grows to 4 feet tall by 4 feet wide. In warmer areas it may grow to 8 feet as an excellent climber. The large flowers, 4 inches across, have approximately 76 petals each. The lovely tea fragrance is medium strength. The handsome leaves have a tough, leathery feel, a health trait that Austin now breeds into varieties. Plant this vigorous beauty upfront in informal borders, in a lare pot, or grouped in landscape plantings. It is suited to full sun or partial sun. Per Austin breeding notes: it is an English Musk Hybrid, as are ‘Roald Dahl’, ‘Desdemona’, ‘Maid Marion’, ‘Lady Emma Hamilton’ and ‘The Generous Gardener’. Hardy in USDA Zones 5-9. (David Austin 2017, Ausquaker). Naming notes: named for Dame Judi Dench, one of Britain’s most beloved stars of stage and screen. Though perhaps best known to younger audiences for her film roles as James Bond’s boss M, head of Britain’s Military Intelligence Service, Dame Judi Dench’s monumental acting career spans decades and includes award-winning dramatic, comedic and musical roles in theater, film and television. ‘James L. Austin’ has beautiful, perfectly formed flowers in an unusual deep pink color that some might call cerise and others fashion fuchsia,” says Marriott. Its rich reddish-pink blooms are spectacular amidst flowering companions in shades of blue, purple, grey, green and cream. Its medium-dark green foliage has a cool matte finish that nicely plays off the flowers’ hot color. The flowers form large rosettes, each with a classic button eye of the sort long associated with the Old Roses (especially the antique Gallicas and Albas). While the button eye is a treasured trait found in many David Austin English Roses, they are nearly non-existent in other modern roses. ‘James L. Austin’ blooms prolifically from early summer until frost. Its dense petals have a silky toughness that shrugs off bad weather. Its delicious fruity fragrance evokes a mixture of blackcurrant, blackberry, raspberry and cherry with hints of lemon zest and almond. The bushy shrub is full at the base, with a tidy, upright habit. It is equally at home in a formal rose border, an informal mixed garden or a large pot. Detail: The compact upright habit of ‘James L. Austin’ is especially suited to more structured settings. It grows to 4 feet high by 3½ feet wide. The large flowers, 4 inches across, have approximately 90 petals each. The fruity fragrance is light-medium strength. Plant it in full sun. 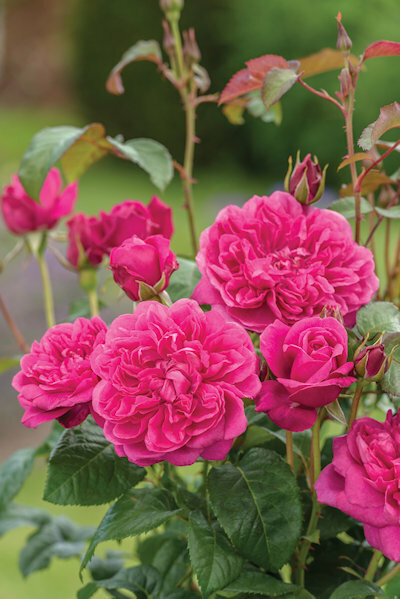 Per Austin breeding notes, it is an Old Rose Hybrid, as are ‘Munstead Wood’, ‘Darcey Bussell’, ‘The Poet’s Wife’, ‘Gertrude Jekyll’ and ‘Jude the Obscure’. Hardy in USDA Zones 5-9. (David Austin 2017 Auspike). Naming notes: named for Professor Jim Austin, chair of Neural Computation at the University of York, UK. He is the youngest of rose hybridizer David C. H. Austin’s three children. ‘Vanessa Bell’ is a soft yellow rose of delicate beauty that already has British gardeners raving. “This splendid rose is one of the most free-flowering varieties David Austin has ever bred. 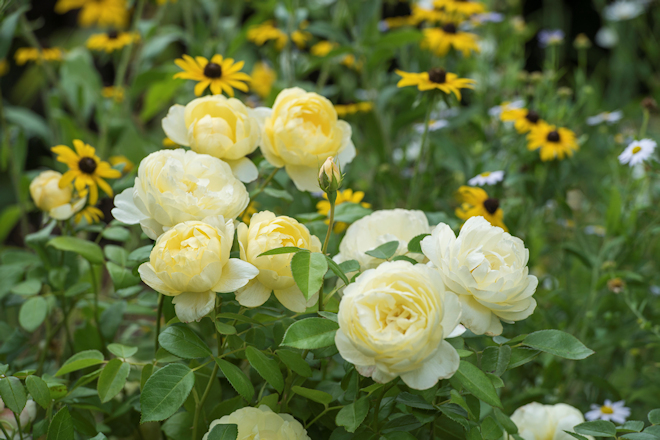 It’s nearly buried in blooms from early summer till frost,” says Michael Marriott, who rates its abundance of bloom on par with Austin’s much heralded recent introductions ‘Roald Dahl’ and ‘Olivia Rose Austin’. “Gardeners covet soft yellow roses for their versatility in garden design,” says Marriott. “Yet superb yellow roses with a fine flower and fragrance plus quick repeat bloom and disease-resistance are quite difficult to breed, thus rare. Of Austin’s 240 English Rose introductions to date, just 15 are yellow and, of those, only six are pale yellow,” he says. ‘Vanessa Bell’ stands a tidy 3½ feet tall by 3 feet wide at maturity. Its bushy shrub is full from the ground up. The flowers are held in large open clusters, accented by rounded buds tinged with rich pink. The flowers are a soft lemony hue set off by a darker yellow eye and paler outer petals that catch the light in a translucent halo effect. The delicious medium-strong fragrance is best described as green tea with aspects of lemon and, at times, honey. Detail: ‘Vanessa Bell’ blooms consistently from early summer till frost. Austin’s team considers it one of their most free-flowering varieties. The compact bush grows to 3½ feet tall by 3 feet wide. Its flowers are medium-sized, 3-inches across, with approximately 45 petals each. Spent petals drop cleanly after bloom. The mid-green foliage has a soft sheen. Plant it in full sun or partial sun. Per Austin breeding notes: it is an English Musk Hybrid as are ‘Roald Dahl’, ‘Heritage’, ‘Queen of Sweden’, ‘The Lark Ascending’, and ‘Graham Thomas’. Hardy in USDA Zones 5-9. (David Austin 2017 Auseasel). Funny that you are mentioning roses. I thought I might try one next year. I haven't had great luck with roses before. Three new beauties but "There is nothing like a Dame!" That apricot color is gorgeous! I am with Peter on this one. There is no one like the Dame and this rose is perfect ! I love the colour and form and might even consider squeezing her in if at all possible. I don't need more roses what with the invasion of the chili thrips, but those are all lovely. Want! Interesting that DA has released so few yellow roses, because here all the yellows have been excellent performers. 'Molineux', 'Golden Celebration', 'The Poets Wife' have been the best of the best of roses.